(March 23, 2019) — NATO claims its rotation of fighter squadrons is a “policing mission”, i.e., it’s a defensive mission against the barbarian Russians who need policing. So then what is flying bombers, which are inherently an offensive weapon? Particularly the lumbering, eight-engine B-52 which is of little to no value in tactical roles against a heavily armed opponent such as Russia, but can deliver cruise missiles and nuclear bombs to level cities and bases. Russian media reported that a B-52 bomber was spotted close to the border with Russia’s European exclave of Kaliningrad and the Leningrad region on Monday. At one point, the RBC news portal reported, the U.S. plane, which had flown from Britain, was less than 200 km (124 miles) from St Petersburg..
Twin contrails mark launch. One missile apparently fails. 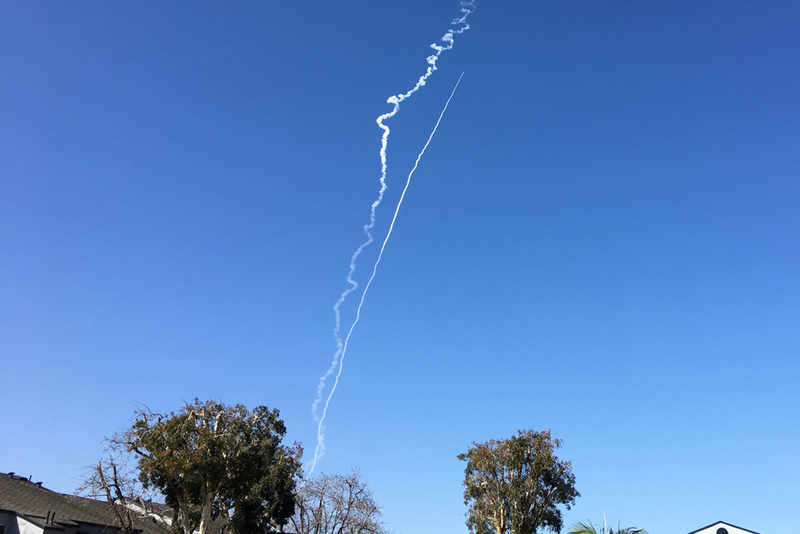 (March 25, 2019) — A missile-defense test involving two launches from Vandenberg Air Force Base occurred Monday amid an unusual veil of secrecy. At approximately 10:30 a.m., two weapons blasted off from underground silos on North Base, leaving parallel contrails visible in the skies above Santa Maria. Vandenberg and Missile Defense Agency representatives remained mum about the upcoming test, although these missile-defense launches have been announced ahead of time for decades. The test reportedly involved the Ground-based Midcourse Defense segment, which is designed to defend against a limited long-range missile attack. In addition to hosting most of the previous flight tests, Vandenberg is home to four GMD interceptors with 40 others positioned at Fort Greely, Alaska. At 11:10 a.m., a Vandenberg Public Affairs representative confirmed a missile test occurred but remained tight-lipped about details and said the Defense Department would release information later Monday. The secrecy surrounding the test hearkens back to the Cold War when Vandenberg launches occurred without official advanced notice. While the military kept the U.S. residents in the dark, the U.S. notified international governments so they did not mistake a rocket launch or missile test for an attack.